From Koh-I-Noor we have the Toison D’Or 5900 and 5608 2.0mm leadholders. In an accompanying role are Koh-I-Noor colour leads. The 5900 is a leadholder which seems to be modelled on the Toison d’Or woodcase pencil. The weight and hardness of the body suggest metal composition, but I could be wrong. It has a clip stamped “Koh-I-Noor”. The clip edges are rough to the touch, and appear very cheap. The cap unscrews and revels four extended blades which form a sharpener. Clever, it works, though not as well as a standard format sharpener. The 5608 (top photo) is something new. Sleek and svelte, it is really a 2.0mm mechanical pencil in a very portable format. The Toison d’Or’s awkward stamping is replaced with a retro rendering of the Koh-I-Noor name. Nice! It also has a cap with a four-blade sharpener. Unfortunately, there is a problem. The 5608’s sharpener can’t sharpen the pencil’s lead since the pencil lacks the ability to grip the lead during sharpening – the lead just spins and spins around. Other blog posts have noted that this problem is shared with other large diameter lead mechanical pencils. This also prohibits the lead from being sharpener with other sharpeners while the lead remains in the pencil. Colour lead in wide lead sizes (2.0, 3.15, and 5.6 mm diameters) can be a great joy – easy to use, and allowing great control. Unfortunately, it can also be hard to find and expensive. Koh-I-Noor’s leads were a delight to discover, due to the range of colours and the richness of the lines. For a few days, I thought I had discovered an exceptional stationery item. Then something happened. 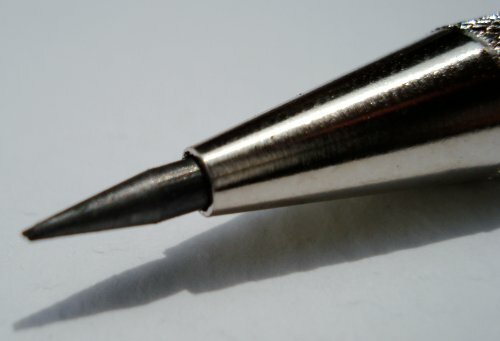 A lead snapped, jamming the containing leadholder. While I’m not an expert, I know this is very odd – leadholders have very simple mechanisms – they are essentially a “clutch” surrounding a tube for the lead – and they don’t jam. Then another leadholder jammed. Something was very odd about this lead. I thought the 5608 might be a great document review pencil with a blue lead – but to my frustration, the lead wouldn’t go in the pencil. 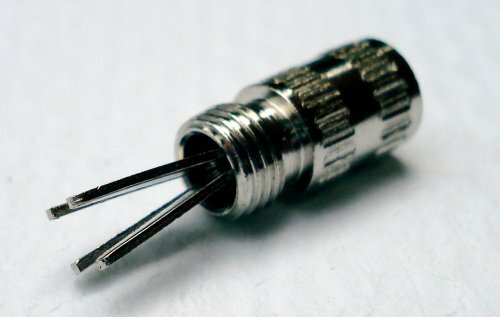 That was the clue and the answer – this wasn’t really 2.0mm lead! I took out the micrometer, and a few samples of Koh-I-Noor lead averaged 2.13mm in diameter. For a reference, I tried measuring a Mitsubishi Uni lead sample – that was 2.01mm. The Koh-I-Noor lead is significantly off specification! It won’t fit even in the manufacturer’s own pencil – nor can the lead fit in standard KUM/Staedtler/Faber-Castell lead sharpeners (I have tried). It further creates complications in standard 2.0mm leadholders. Though the colours are nice, I am very disappointed with this offering. Koh-I-Noor is a mainstay of drafting, drawing, and writing supplies that I admire, but it looks like the design department got the whole budget for these products, while engineering was neglected. Thank you for the detailed review. The 5603 looks nice – is it still available? Thanks, today haven’t been a waste: I’ve learned something new! Sad to see that the Koh – I – Noor has joined the “lack of quality control club”. Gunther, it is indeed available – this specimen came from CultPens. Yet another nicely photographed pencil review. Pity the color leads did not live up to expectations, but that lead pointer design is certainly quite original-looking if not too efficient(with a similar working principle to the Koh-I-Noor 25961 Pocket Precision Lead pointer, but lacking a guide to keep the lead centered). Other than the 3.8 mm Caran D’Ache Museum watercolor leads, I have yet to find reliable brightly saturated color leads for any of my leadholders. The few I managed to acquired are rather dull or tend to crumble and jam inside the leadholders’ chambers too. The Kooh-I-Noor 5900 is my favorite travel lead holder and it goes everywhere with me since it fits quite nicely alongside a Fisher AG-7 in a Levenger international pocket briefcase wallet. I get my 5900s from Andrey’s ebay store. I use Mitsubishi 2.0mm Uni leads, and wish to match the Palmomino woodcase pencil’s HB lead characteristics. Maybe I’ll get lucky when experimenting with Uni grades. I’ve been eyeballing the 5603 for some time. I like the compact size. And the lettering is very nice. Note that it’s listed on Cult Pens as 5608, not 5603. Andrey’s as well. Sorry for the error – I’ll correct it. I have a lovely set of enameled metal body Koh-i-noor pencils with different body colours to match the coloured 2mm leads I get from Andrey’s on ebay. The clutch on these (and the pencil featured) is machined whilst fully retracted and so when opened slightly to accommodate the lead the resulting angle causes only a single part of the interior clutch face to contact the lead. This make it impossible to use the sharpener tool, as the lead is not properly gripped and also causes the lead to snap often as it is held at such a small singular collar of pressure by the jaws of the clutch. This can be resolved by extending the jaws of the clutch and gently bending them inward a fraction, so that their whole inside concave face contacts a sufficient portion of the lead to grip it, holding it during sharpening and preventing breakage. This is ridiculously geeky, I know, but I love their pencils and as an industrial designer I had to share. 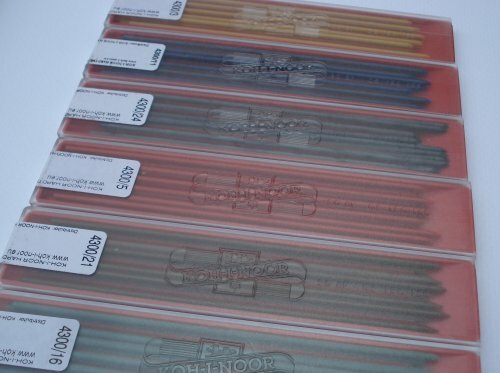 I’ve been using the Koh-I-Noor Rapidomatics for about 18 years now, ever since I started university. I had 0.3, 0.5, 0.7 and 1mm. Of the four, I always come back to the 0.7, as it’s perfectly balanced for my penmanship. The leads rarely break if pressure is exceeded. The 0.3 and 0.5 had a tendency to break off. Blue 2mm lead from Hardtmuth also jammed a Koh-i-noor 5900 pencil which I use. It also jammed a very basic Venus leadholder from the 1950s. Sad to hear the mismatch between lead and leadholder is the probable cause. I also had trouble with Atlas 1.1mm green leads which jammed a 1ate 1920s Parker Duofold mechanical pencil. HB graphite leads from the same company work quite well in the Parker pencil. Is there something about coloured leads in general, in addition to the mismatch in sizes? i actually own some Koh-I-Noor woodless colored pencils. Some of the greatest colored pencils I have ever owned to be honest. Just happened on this thread while surfing and thought I’d drop a thumbs up for the 5900. I have 3 of these and a Staedtler 780 and the 5900 shows old time machine quality and construction that leaves the 780 in the dust. While the 5900 does not have the sculpting and finger grip of the 780 having, instead, a straight body that is finished in gloss that can require repositioning of the hand over time as I use the pen. I too can not quite tell if the body is a dense plastic or metal but I tend to think a resin as if you look at the end there appears to be a metal insert where the internal assembly screws into the body. Also, the colors are applied and one of mine has been used enough to have worn through the black to some kind of a primer. Nice patina is developing. Whichever it is, the body is substantial and I do not think in other than very abusive use will it break. The guts where it really counts is all metal, no plastic tubes here. You can see where the pusher and point end are clearly machine turned. Even the pointer shows thought went into the design and execution of the holder. The 780 by contrast is a more modern execution and shows it. Not that it is a bad holder, it is quite good but compared to the 5900, it is an economized execution of a fairly nice design. It has less heft and is not as well balanced as the 5900. My son who holds his pencils quite close to the lead finds the 780 less comfortable. I use Staedtler leads in both as this is what is locally available. Both grip the lead about equally well. I find I grab the 5900 when I am working (I do accounting and tax so, columner pads are a way of life) and lead control is more important while I grab the 780 for writing. Most surprising for me was when I first bought my 780 and 5900 which I did at the same time, the 780 was 2x the price. I expected the 780 to be a clear winner but after more than a decade with them, they are too close to call though I tend to prefer the 5900 other than the stupid afterthought pocket clip that can rip a shirt up. Happily it is a slide on and I’ve intentionally lost them all. If I had tolive with only one, it would be a 5900. Ed Bagenal’s helpful suggestion about bending the jaws of the clutch to fit the lead better applies only to the 5900 Toison d’Or leadholder; the 5608 automatic pencil has a different locking collar of brass which is not amenable to bending. The 5900 leadholder is made of a light metal alloy. It is one of four all-metal 2mm leadholders(i.e. metal body and mechanism)listed in Koh-i-noor Hardtmuth’s catalogue: 5900 Toison d’Or in black; 5201 Versatil in yellow; 5216 Versatil in 10 colours; 5217 Versatil in a set of 5 colours. All these leadholders are very similar indeed, differing only in the colour of the enamel. BrianL’s comment on the durability of the 5900 is reassuring. It was selling for approximately $3.75 in Eastern Europe. i have the 5900, which i like, but i have to say: i think i would like the grip of the 5608 more. i hadn’t seen this one before -thanks for reviewing it! I use the Koh-i-Noor coloured leads quite a lot and love them, granted they are not suited to any auto-advance leadholders I’ve tried but I use mine in Caran d’Ache fixpencil 22s and I would really recommend the combo. Thank you so much for these photos! I recognized my missing pencil the second I saw them. I was looking for exactly this pencil for over one year and i am very happy that I know the right name now, I just ordered it again – twice. This is by far the best pencil I personally ever wrote with. The Toison d’Or 5905 model fits all lead from 2mm to 2.5mm and the odd colored lead sizes could be the reason why KIN has such a clutch pencil in its stable. Otherwise it is exactly the same pencil as the one in the photo. Andrey’s stocks them. Agree about the clip which is very thin and poor quality. Anyone know of a standalone lead pointer that will work with the 5905? I’d love to use this pencil more but it doesn’t fit in my Dahle! Colour leds are specially designed to Versatile ledholders. Kum have a plastic pencil sharpener (same design as thenPalomino sharpener, which they also make, but it doesn’t have the lead pointer) which has two size sharpener and two lead pointers, 2mm and 3.15mm in the sides. Though it has proved to be a sturdy workhorse, the black paint on the barrel of the Koh-i-noor 5608 mechanical pencil has bubbled and flaked off revealing the underlying brass. Wish now that I had not given away so many of them as gifts leaving only one for myself.